This is the biggest selling model in our suitcase range, and will give you maximum continual power of 1600 watts. This also comes as standard with a parallel connection socket which would allow you to connect two or more parallel configured Kipor generators together. This feature would allow you to connect even miss-matched generators together, ideal for when you want to run high load devices that are only occasionally required. This feature is also ideal for automotive sport applications allowing you to power small compressors or pressure washers using machines which would normally be too small. In typical caravan use this will be able to charge up your leisure battery your mobile phones and lap tops and most other tablet devices. This is the first machine in the range that will happily power your microwave and also the “good ladies” hair drier. It would also allow you to use travel kettles (put the tea on love!!) or travel irons (where’s my shirt!!) even at the most remote locations. 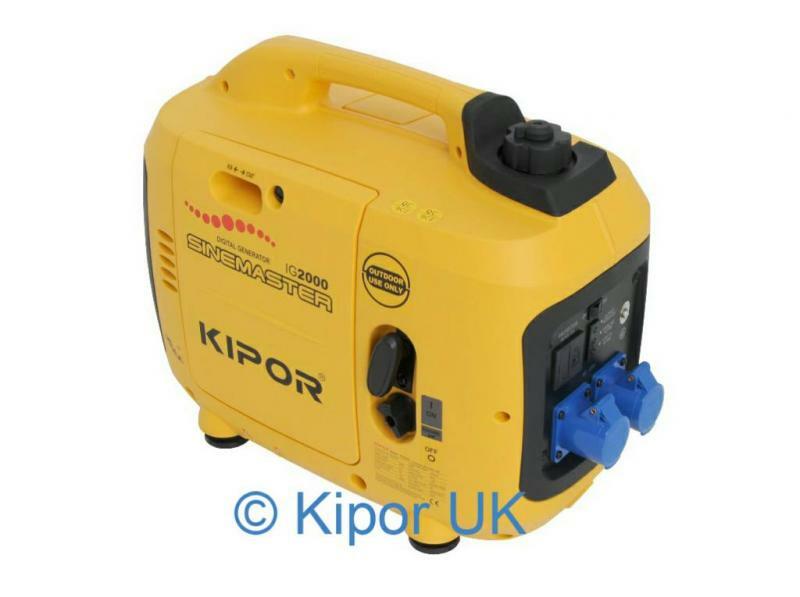 With this machine your caravan battery will charge in the same time as if connected to the hook up on site or at home, its the battery charger in you caravan that determines the recharge time, not the size of the generator. Also a quick tip, if you are looking to watch TV, use your leisure battery through the evening and re charge the battery in the day time. This way will be quieter during the evening hours and you will run the generator for fewer hours in the morning using less fuel and keeping the running hours low. A full tank would normally last about 4 hours on a full load, but will typically run for 5 to 6 hours in normal use, the machine also comes with integral overload protection, so if you accidentally overload the machine it will automatically cut out, this ensures that you do accidentally damage any of the components but it is a fail-safe device and should not be relied on in day to day use. TAKE CARE and ensure you only connect loads suitable for this machine. So as I said, this is the most popular machine in the digital range, it will run microwaves, or small 1600 watt kettles. It will not power up air conditioning units or compressors but it will happily power up the tyre warmers in motor sport activities. If you have a power-cut at home the IG 2000 would be suitable to back up your fridge and freezer and provide the power to run the central heating and still have a little in reserve to provide some lighting as well. You need to make provision for how you would connect to your property in the event of a power cut. The only recommended method is to have a manual transfer switch fitted by a registered electrician. In this way the house can be isolated from the National Grid during the power cut allowing the generator to be safely used. When the power is restored simply switch back to the national grid and turn off and store the generator. So overall our most popular machine seen by many people as the idea travelling companion in most caravanning , boating or motor sport activities. This machine will also provide a reasonable level of support for home use during power failures..